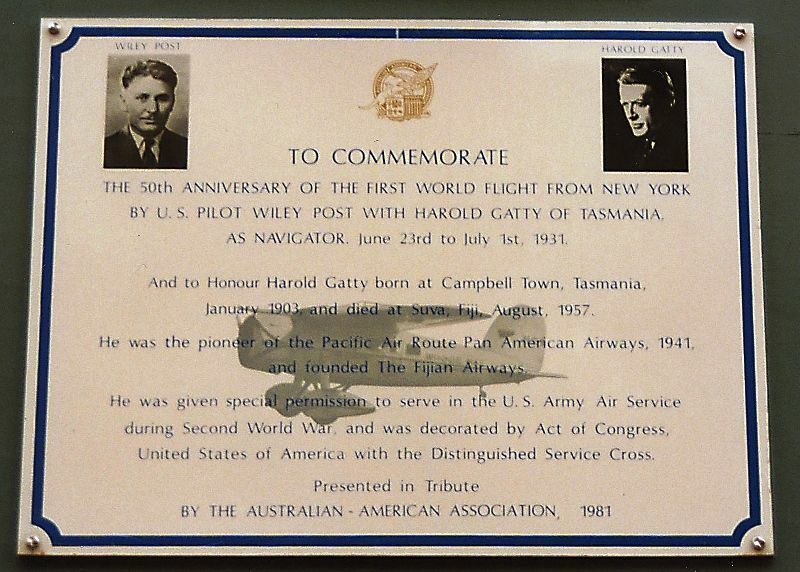 A plaque commemorates the fiftieth anniversary of the first world flight in 1931 from New York by United States pilot Wiley Post with Harold Gatty of Tasmania as navigator. In 1930 the record for flying around the world was not held by a fixed-wing aircraft, but by the Graf Zeppelin, piloted by Hugo Eckener in 1929 with a time of 21 days. On June 23, 1931, Post and his navigator, Harold Gatty, left Roosevelt Field on Long Island, New York in the Winnie Mae with a flight plan that would take them around the world. They arrived back on July 1, after traveling 24,903 kilometres in the record time of 8 days and 15 hours and 51 minutes. To commemorate The 50th anniversary of the first world flight from New York by US pilot Wiley Post with Harold Gatty of Tasmania as navigator. And to honour Harold Gatty born at Campbell Town, Tasmania, January 1903, and died at Suva, Fiji, August 1957. He was the pioneer of the Pacific Air Route Pan American Airways, 1941, and founded the Fijian Airways. He was given special permission to serve in the US Army Air Service during the Second World War and was decorated by Act of Congress, United States of America with the Distinguished Service Cross.